This is a boisterous mystery with an intellectual backbone. 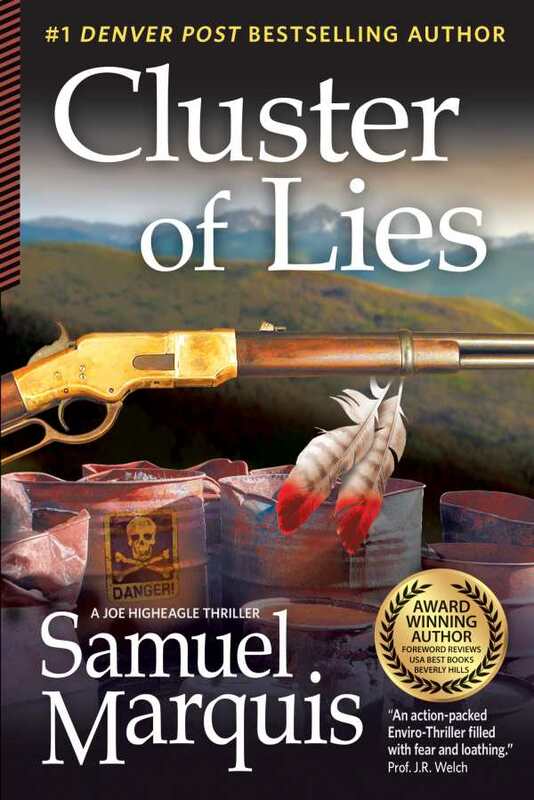 Cluster of Lies by Samuel Marquis is an entertaining and unpredictable thriller that kick-starts and shows no signs of slowing. Young boys from the same Colorado neighborhood are dying from a rare brain cancer, and the community demands answers. Joe Higheagle, a young Cheyenne geologist and the newly minted owner of Higheagle Environmental, is hired by a wealthy and secretive octogenarian to investigate the dire situation. But when environmental concerns tangle with big business ventures and cold-blooded murder, Higheagle must prepare to fight for his life. With swift but steady pacing, convincing character development, and snapping prose, Cluster of Lies keeps the hairpin turns and roadblocks coming, weaving a brisk, fun tale of duplicity and extortion with a heaping helping of heart. Higheagle, a shrewd scientist-turned-unofficial-detective, is a witty everyman and an all-around good guy. Hayden Prescott III, the local narcissistic billionaire, is a self-proclaimed “card-carrying member of the elite 1%” with a laser focus on getting his way. As adversaries, the two men share a mutual respect and hatred that keeps the heart of the novel pumping. The book brings home the realistic horrors of cancer, as shown through the eyes of Sally McTavish, whose son becomes the latest victim of the unexplained cancer cluster. Some characters ooze humanity, even when least expected, while others are rife with vile plans and entitlement. But each is written with a distinct voice and focus, making them credible even if they aren’t always likable. The examination of Cheyenne culture distinguishes the novel. Higheagle is driven by his heritage, which is exemplified by powerful details such as decadent traditional meals of “smoked buffalo sausage, cooked with a red chile polenta and spicy wild game mustard sauce” and the description of his grandfather, a Cheyenne holy man. The Battle of Little Big Horn is even used to parallel the moral and legal battles waging in the book. The writing ebbs fluidly between rapid-fire dialogue and lovely language, making for an enjoyable page-turner. The story knits myriad themes together to keep the plot consistent and believable. Science, business, Cheyenne culture, the power of money, and the puppet strings of politics are all set against the well-painted Rocky Mountain landscape, and work together to give the book a high level of authenticity on all fronts. Cluster of Lies takes a fresh approach to the standard thriller paradigm with a protagonist who’s more Columbo than CSI, resulting in a boisterous mystery with an intellectual backbone.